Pass Aggressive is a microgame found in the Cute Cuts stage in WarioWare: Touched! It later appears in WarioWare Gold as one of Young Cricket and Master Mantis' microgames. The name is a pun on the term passive-aggressive, a type of behavior. 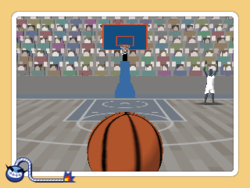 The objective of the game is to pass the ball to the other members of the basketball team while avoid passing it to the opposing team. 1st level difficulty: There is one teammate to pass the ball to. 2nd level difficulty: There are two teammates, and one defender moving back and forth. 3rd level difficulty: There are two teammates, and two defenders moving back and forth. This page was last edited on October 1, 2018, at 11:27.